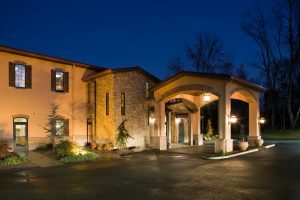 Bella Sera Event Villa is a beautiful venue located 25 minutes south of Pittsburgh just a mile from Route 79 and the Southpointe exit. Built mainly with weddings and celebrations in mind, they also host a large variety of corporate, social and charitable events each year. Bella Sera is celebrating their 13th year in business and was voted Best of Weddings by The Knot and Wedding Wire for six consecutive years, and they recently took the title for Best Event Venue & Best Wedding Venue in Washington County, by the Observer-Reporter. This Tuscan-inspired property is tastefully designed inside and out with many details & furnishings straight from Italy. Situated on seven picturesque acres, guests are surrounded by trees, beautifully landscaped gardens, and a quaint pond with waterfalls. The indoor features boast a vintage wine cellar, sweeping stairway and large stone fireplace—making Bella Sera a stunning backdrop for weddings, showers and other public events like wine dinners, Spaghetti with Santa, Easter and Mother’s Day Brunch. The culinary team led by Executive Chef Giuseppe Di Gristina, serve classic Italian dishes and new creations sure to please even the most discriminating palate. The talented Bella Sera service staff strive to deliver the highest and most genuine level of service possible. Founder, President, and chef, Jason Capps, continually invests in the property and, more importantly, his capable team. With two new restaurant ventures, a certified green trattoria in South Fayette and the relocation of their bistro to the heart of Southpointe, Bella Sera is expanding their reach to make a lasting impact on the region. Recognized as the first certified green venue in Pennsylvania, Bella Sera is 3-Star certified by the Green Restaurant Association and has a Silver designation with the Sustainable Pittsburgh Restaurant program. Their sustainable efforts include an ongoing and complete recycling and composting initiative, flow regulators for all faucets—which reduce water usage by 40%, and motion-censored lighting throughout to help cut costs and reduce energy usage. Capps also pays higher than the industry standard and offers quality healthcare, 401K and other employee perks not often found in the foodservice industry. This overall winning combination has allowed Bella Sera to support vibrant communities and a healthy environment within the region and set the standard for excellence in their field. For more information about Bella Sera’s sustainability efforts, you can view their Sustainable Pittsburgh Restaurant profile and read their complete designation report. Looking for a venue for your next special event? Contact the staff at 724-745-5575 or stop by 414 Morganza Road in Canonsburg. Bella Sera is ready to serve you!